Let’s talk about eggs, shall we? I dislike eggs, did you know that? I can eat them scrambled, but only if they are covered in cheese and have ketchup on them. I know, it’s weird, but I honestly dislike the flavor of eggs, unless, of course, I bake with them. Here at my house, my dude and my kid eat boiled eggs like they are going out of style. No joke, he boils them a dozen at a time and we always have them in the fridge, so I try to make them a little more interesting by making them deviled eggs and they snack on them like I’ve created a culinary masterpiece. 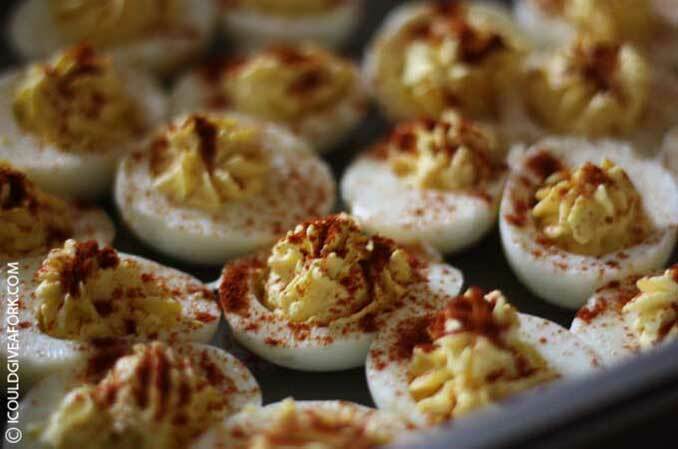 There are many recipes for Deviled Eggs, but my kid loves paprika, but only the smoked kind so if you sprinkle that on about anything, she’s into it. She loves to put the mixture into one of my piping bags and swirl them into the centers so I mix it up for her quite often and this is her favorite recipe. It’s simple and quick and she swears they are the best on the planet, even though she hasn’t tried every recipe on the planet, she loves her mommy’s recipe. Kids. They’re so awesome. This recipe is for 1 dozen eggs, but can be easily doubled or tripled if needed. The ingredients are basic, but the flavor (so I’m told) is out of this world, so if you like eggs, check this recipe out. Peel the eggs, cut in half and scoop out the yolks into a bowl. Add the mayo, mustard, pickles, pickle juice, sugar, vinegar and salt and mix well with a fork. Using a spoon or piping bag fill each egg white half with mixture.